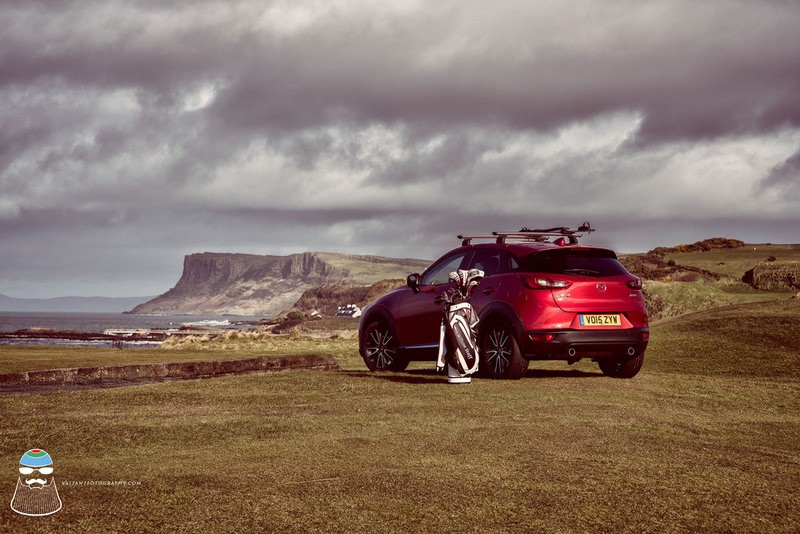 Recently I received a call from Mazda UK's PR department wanting me to shoot the new CX3 on the Causeway coast road of Northern Ireland, the brief was to showcase the vehicle been used in different sporting activities, aimed at the 30's generation. The CX3 would make its way across the UK driving the most gorgeous coastal roads and capturing the car in different locations. 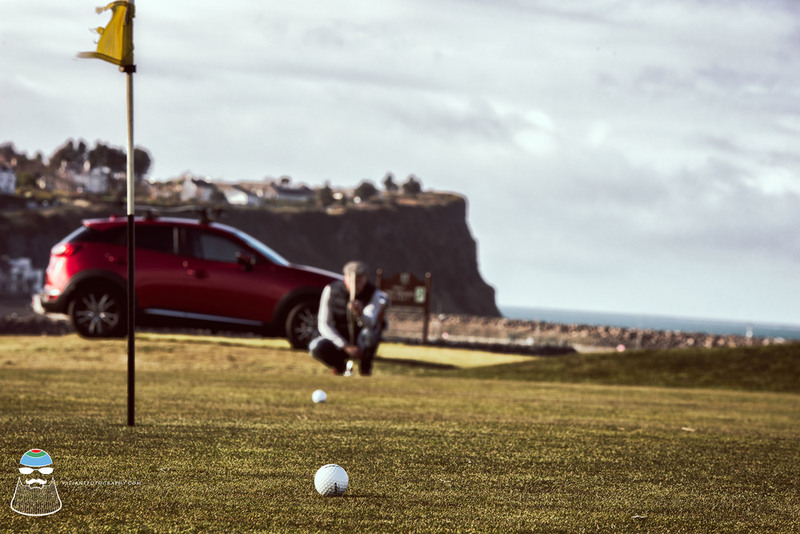 We had decided to use Golf and scuba diving as our activities, naturally the thought was to shoot the car on the Royal Portrush Golf Course, it made sense as its among the top golf courses in the world, sadly they did not seem interested or wanted to be associated with the brand. It was decided that Ballycastle would be an excellent alternative, giving us fantastic views over towards Fairhead. We managed to get the car onto the fairway right next to the green, allowing us to capture some wonderful images. Some folks seem to think that a set of golf clubs would not fit in the boot of the CX3 i set about to prove them wrong, infact the golf bag fits in beautifully you just need to take out the drivers........ Now thats not a unique issue to this car but to most cars today, unless you drive a luxury model with tons of boot space. It has generous boot space and the clubs fit in quite well. The weather was fantastic, i wanted some puffy clouds in the air and they were spot on, giving us a nice dramatic feel to the coastline and what can be at times a rugged coastline. The following day we opted to go down to Ballintoy harbour, as its a great location set in dramatic style, it can be a very busy location as its really popular, even more so now after they filmed some scenes from the very popular Game Of Thrones series here. I knew i could get the car on the pier near to where i wanted to shoot. On a stormy day this little harbour can produce some amazing and really awesome wave action as they break over the rocks. Here it was the time for scuba diving, again plenty space for wet suits, BC's cylinders,masks and fins. Its a comfortable car to drive in, as im really tall and sitting in the back seat there were no issues with leg room. Its an all round really versatile car. No shoot is complete without a visit to the now famous Dark Hedges, another location for the Game Of Thrones TV series. This can be a tricky location to shoot now without anybody else in the image, it has become that popular. It also proved to be the most popular image from the series, with a whopping 28% engagement on social media, when the norm is around 5% on the Mazda UK social media platforms. These tree's are in their current state of been leafless, and look dramatically different when they are in their full leafy state.